UPDATED: Wed., April 3, 2019, 9:18 p.m.
Washington state and the U.S. need to invest more in renewable energy and fighting climate change than either entity has so far. 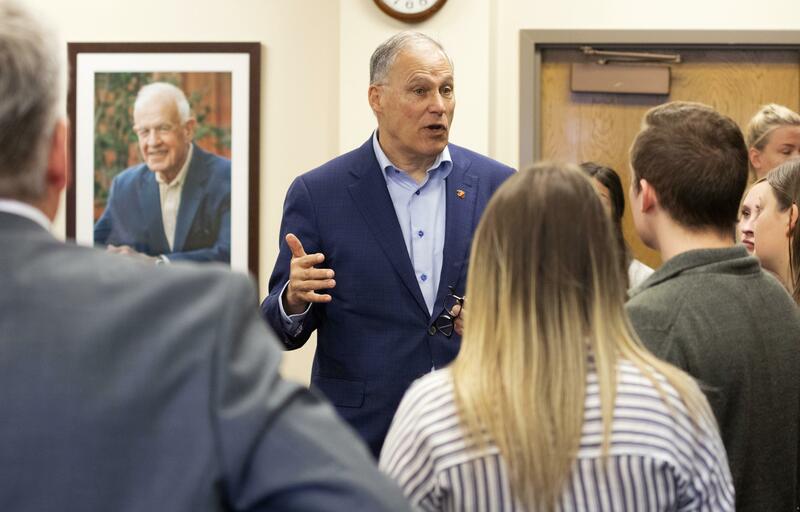 That is the message Jay Inslee, Washington state governor and 2020 presidential candidate, gave when he visited Washington State University on Wednesday morning. The visit was sponsored by the Thomas S. Foley Institute for Public Policy and Public Service and held before an estimated crowd of 300 at the Bryan Hall Theatre on the WSU campus. Inslee, who recently introduced a package of bills aiming to get Washington to 100 percent clean energy by 2045, said he wants to focus on transitioning the workforce to more jobs in renewable energy. Jobs in solar and wind are among the top two growing occupations in the U.S., according to the the Bureau of Labor Statistics. Inslee has proposed a number of bills to the state Legislature aimed at reducing the state’s environmental footprint. A notable example includes a carbon tax proposal that failed in the Legislature last year. He said the 2019 bill and his 100 percent clean energy package are different, because more constituents are noticing the effects of climate change firsthand. Although the talk was not focused on Inslee’s presidential run, the governor did take the opportunity to criticize President Donald Trump for the administration’s removal of environmental protection laws. “We have a federal government that’s let us down in the past few years,” Inslee said. He also made specific reference to a statement by the president in which he claimed people relying on wind power would be out of electricity whenever the wind stopped blowing. Some audience members asked how transitioning to renewable fuel and energy would affect communities whose economy is reliant on fossil fuel, and how Inslee planned to help low-income people who could not afford an eco-friendly infrastructure. Inslee said the change to renewables would be gradual and have built-in protections to help communities adjust to a different economy and build small businesses. Some attendees asked the governor about his openness to nuclear power. Inslee said he wanted to see continued research and is open to any low- or no-carbon energy options. However, Inslee said he wanted to see decreased cost, am increase in safety and widespread public acceptance before considering nuclear energy as a renewable option. He said it is important to find better solutions for the disposal of nuclear waste. One audience member asked the governor if he supported the “Green New Deal” put forward by Rep. Alexandria Ocasio-Cortez of New York. Published: April 3, 2019, 7:57 p.m. Updated: April 3, 2019, 9:18 p.m.